The flipping craze that has swept the world at present – whether it’s a bottle or a knife – has certainly reached a fever pitch. This is because it has already inspired the creation of dedicated game apps that lets you do just that. One of the finest examples of this is Flippy Knife. Based on its name alone, a lot of players would probably call to mind the hit phenomenon that was Flappy Bird. Flippy Knife actually bears a considerable resemblance to the said game graphics-wise as well as in the former’s arcade aspects. Indeed, Flippy Knife’s gameplay is simple and to-the-point: you flip knives and score points based on how skillfully you are able to handle them. You only need to tap on the Play button to begin a playthrough. There are a couple of modes to choose from as well. The basic one is concerned with flipping your knife on a log by swiping up while always making sure that it lands upright, with the blade embedding itself into the log. The number of flips that your knife does in mid-air while making sure that is always able to land blade-down determines your score you get per throw. However, this is only one criteria for scoring as the weight of the weapon also comes into play. Of course, this is only one of the many modes you can try out. There is one that involves collecting coins and treasure in mid-air while accurately throwing your knife, while being set in different places like camps or forests. Another mode requires you to hit moving targets (with a bull’s eye) using your throwing knife; the position on the target that you’re able to hit determines your score. There is even a game mode that mirrors a Mario-type of gameplay, which involves getting your knife across multiple platforms, while making sure that it always sticks on the surface and doesn’t fall off. 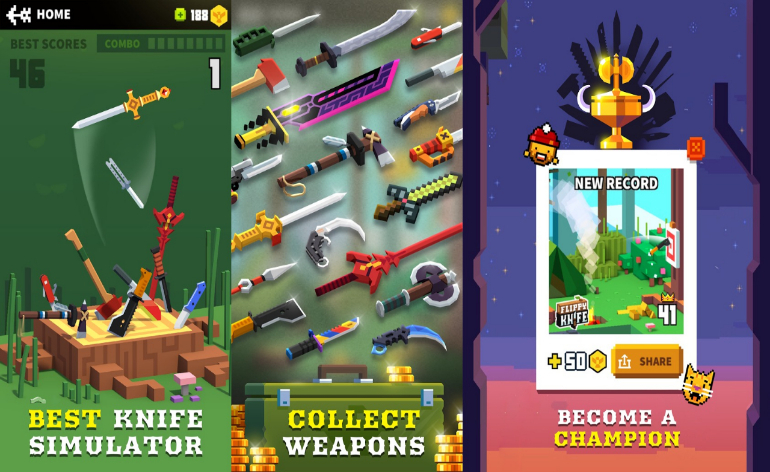 Another outstanding aspect of the app is the vast collection of weapons that it offers the player to unlock. It’s not all about knives as there are plenty of other weapon you can flip like long swords, rapiers, and axes, to cite a few. The coins you collect and score you earn while playing can be used to purchase the weapons that you like. The app keeps track of the highest score you can get in each of these modes, and you can easily share them to your friends on social media. Besides coins, it also rewards you with badges as you earn various in-game achievements. The accurate way in which Flippy Knife has simulated the act of knife-flipping is certainly one of the defining features of the app. It’s quite hard to compare the app to other apps since it introduces features and gameplay that are wholly unique – at least, compared to the current arcade games available in the Play Store. It’s because of this same originality that the app has already garnered a lot of dedicated players and positive reviews. Lastly, the 3D graphics of the app really deserves to be highlighted too, as it has been praised by players as very simple yet visually-pleasing at the same time.